The place if you have forum issues to report, questions, feedback or just need information. I would like to thank those who have made this site what it is over the years, especially the moderators and admin! Without your struggles, this site would be nothing but bloat, full of spammers and malware! Thank you! Like many of you, over the years I have enjoyed this website and used it to learn and share soaking trips and knowledge. While I wasn’t the most active participant in the forums, and more of an unregistered lurker for many of those years, the thought of forever losing SF was one I could not accept. After little thought I decided to offer my resources and knowledge to help SF live on. While I have become the official owner of SF, this is not my site - it belongs to each and every one of you, the users. I see SF as a community of users, viewed by users, created by users, managed by users, and content posted by users. Thus I will be asking you, the user for your input and thoughts. In the next few days the site will be disabled while everything is packaged up and moved to its new home. During this time some updates will be applied and a few minor tweaks to the software will be made to help prevent spammers. Once everything is stable the site will open back up and be back to business as normal, I expect this to happen no later than Saturday the 11th. Photos: To help counteract the headaches and make this forum more of an information exchange, one of the first changes I plan to implement is to allow photo attachments in post. I feel that such a move would make those of us who share photos a lot happier to skip some steps! Thoughts? Design: Over this winter when things slowdown, I'll be looking to give the overall design of SF a small facelift, just to get away from the typical phpBB look. Nothing radical, simple yet distinctive. Logo: I know over the years there has be attempts (some good ones too!) to brand SF. I’d like to see a dedicated logo for the site. What ideas do you have for SF? What do you see in the future of SF? Thank you and soak on! Dan, thank you so much for taking the helm of SF as the new official owner! We know you will continue the good work that Eric and Bruce have done in the last 10 years! And it goes without saying that many soakers are very grateful that SF will live on. Now we just have to do our part and get out to some hot springs and report! "May Your Soaks Be Pristine in 2019!" Thanks SO MUCH!~! for taking over SF. We all appreciate it more than you know. We pledge to support your efforts any way we can and will do out best to add to the few posts we've made to SF over the years. If you need help with anything, please don't hesitate to ask. Many Thanks for keeping this site going, hope we can get together for some hot springs soaking next year, we have so many good ones in our area that are still clothes free and primitive, perhaps we can start a soakersforum tour in the future. Sharing information and pictures on our beloved hot springs is the reason for this Forum. Everyone help, by adding input, please! Who left the bag of idiots open? Dan, thank you very much! Never put off until tomorrow what'll wait till the day after. It's good to have you back! It's been years! We hope you've been well and that we hear more from you. Have you been soaking anywhere lately? Last Christmas Day (so no, not lately) went to Spence. It was barely body temp in the main pool and so the 5 of us that were there crammed ourselves into the source cave and enjoyed for an hour or so. About 20 degrees outside. Loved it despite the cool pool. Thanks for the warm greetings - enjoy the holidays!! I would like to see current topics ie recent posts when I open this forum, instead of having to search for them. Reading the messages is fine of course, but we need ALL the membership to contribute and communicate here not just lurk in the background. Some of us live near hot springs, some live far from any soaks, but we all share the love of soaking, join in the conversation! John you can go to Quick Links to see new posts. In theory I suppose Dan could expand the Quick Links and spread them out on that line, but I’m sure he wanted to show them collapsed together in Quick Links to save space. That is default setup for this forum, I can see what extensions are available to see recent topics. Thank you very much for keeping the site going, it is an important link to hot springs for many of us who for one reason or another may not be able to go in person anymore. Not much going on here, I had hoped there would be more posting by now, I guess it is time for me to bow out and ride off into the sunset, times change but I won't anymore. Can I delete my membership only, not my posts of course! We don't know what you mean about not much going on; there are new posts and topics nearly every day, which we consider to be pretty good for it being the dead of winter. May we encourage you to keep your membership and post from time to time, when you're so inclined? You can lurk for weeks or months and still be a member. All your past posts have been appreciated and we hope you stick around. Sad to see you go, John. You've made a great effort in past months before & after to bring refreshing new information to this board. and you can then read if the urge ever returns in future. I was a lurker for years on some forums (eg Saline & Deep Creek) before posting. 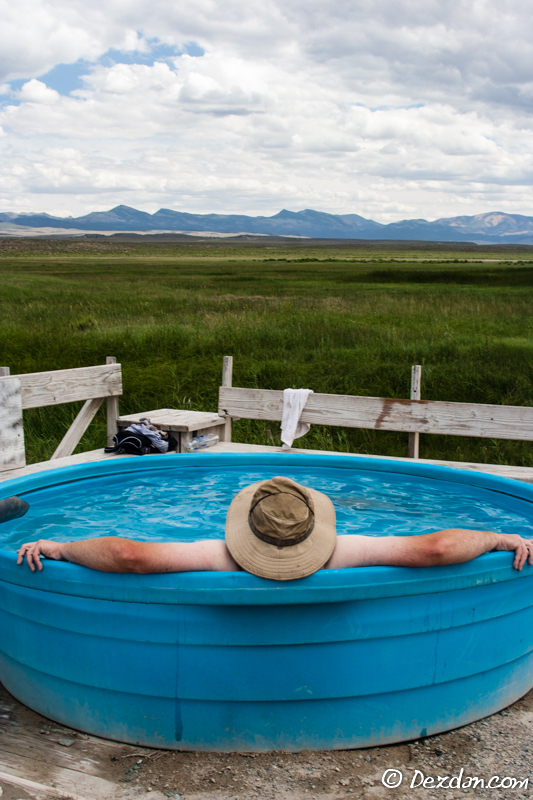 Planning to hit more Nevada hot springs - your home area. I owe a report on 12 mi HS near Wells NV from last week. John, perhaps keep your membership and you can always just monitor occasionally. I am very new to the site, but just want to say THANK YOU! to all and that I cant believe I haven't found this sooner. I live in Mammoth, but have been venturing through Nevada and doing a lot of exploring there, so hope to be useful to those forums. We look forward to your input. May we add, it's OK to use first names here; many of us do. It's a friendly and flameless forum. Hard to believe longsoaks would just up and leave ! But wait there are small signs of life - a few posts ! Oops lets not rock the boat. Hard to think of a better place to live than Mammoth for soakable hot springs. You can go North, South, East, or West and be rewarded with Hot Springs. You must see the incredible list of 25 by hotspringshopper along 395. "Winter conditions around Lake Crowley/Mammoth hot spring area?" Welcome also , to Cgreer00 for posting on Soakers Forum. You are so lucky to live in Mammoth Lakes, CA. You have a plethora of free beautiful hot springs at your doorstep. They are so close to you, you could soak every day or night if you wanted to . There are five concrete tubs and one with a concrete dam and silt bottom within 25 miles of Mammoth Lakes,CA in the Long Valley Caldera near the Mammoth Airport. If you want to visit several of these in the winter , you could park your car at the intersection of Benton Crossing Road and 395 , at the " Green Church " and cross country ski into five of these. The one at Little Hot Creek , you could park at 395 and the road leading to Hot Creek , and ski in past Hot Creek , and on up to Little Hot Creek following the snow covered dirt roads. I sent you a PM a few days ago. Mdskibum , Thank you for the compliment on my Eastern Sierra Hot Springs List. I sent you a few replies on Winter Access ... CA and a PM this evening. Copyright © 2017 SoakersForum.com. Hosted by Sagebrush Host.